This Lucid 10 Inch Memory Foam Hybrid Mattress Review was recently completed by the MattressJunkie.com team. 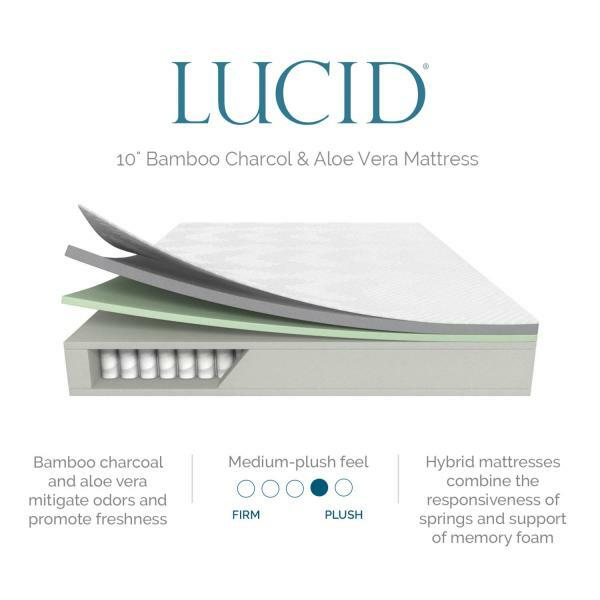 Lucid recently sent us their 10 Inch Bamboo Charcoal and Aloe Vera Memory Foam Hybrid Mattress to review. 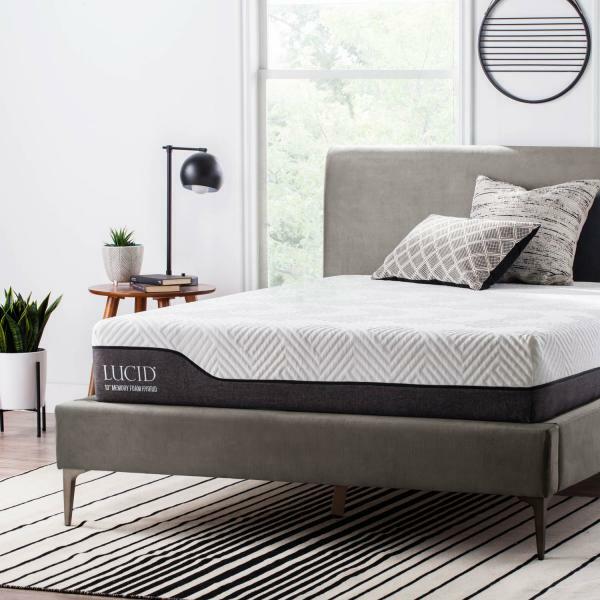 Lucid has an array of affordable sleep products that are shipped direct to consumer cutting out the middle man and as a result, cutting out a huge chunk of the cost. We have reviewed several items from Lucid’s collection and have been impressed with the quality. Check out what we thought about the Lucid 10 Inch Memory Foam Hybrid Mattress. Tell me more about the Lucid 10 Inch Memory Foam Hybrid Mattress cover. 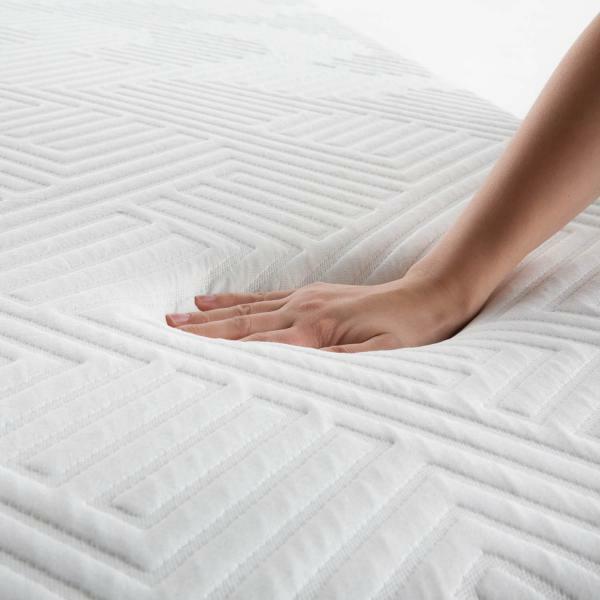 The Lucid 10 Inch Memory Foam Hybrid Mattress cover has a circular pattern and is made from knit fabric. The cover is light and stretches well on the mattress. What’s Under the Lucid 10 Inch Memory Foam Hybrid Mattress cover? Layer 1 of the Lucid 10 Inch Memory Foam Hybrid Mattress is 1.5 inches of bamboo charcoal memory foam. This layer provides comfort while also giving the mattress a natural odor reducing and moisture wicking properties while allowing breathability so you sleep cool throughout the night. The 2nd layer is 1 inch of aloe vera transition foam. Transition foam provides support and serves as a barrier between the comfort top 1.5 inches of memory foam and the 5.5 inch encased coils. The 5.5 inch encased coils provide support, individualized pressure relief, and motion isolation. Under the coils is a 1 inch layer of support foam. What Sleep Style Works Best with the Lucid 10 Inch Memory Foam Hybrid Mattress? The Lucid 10 Inch Memory Foam Hybrid Mattress would work for any sleep style. The encased coils that make up 5.5 inches of the mattress, respond to body pressure. This allows any sleep style to work well on the Lucid 10 Inch Memory Foam Hybrid Mattress. What type of base should I place my Lucid 10 Inch Memory Foam Hybrid Mattress on? Box spring, platform base, slatted base, or an adjustable bed frame will work just fine with the Lucid 10 Inch Memory Foam Hybrid Mattress. Mattresses will sometimes have a slight odor when unrolled from the compressed packaging. This is called ‘off gassing’ and is often described similar to a new car smell. Once you open your mattress, let it breath to fully inflate. This will eliminate the majority of the scent. I usually find the odor to be unnoticeable within 24 hours or so. The Lucid 10 Inch Memory Foam Hybrid Mattress didn’t have a strong off gassing odor. I didn’t notice a smell at all after a few hours. For those who tend to sleep on the warmer side, the encased coils allow for maximum airflow in the Lucid 10 Inch Memory Foam Hybrid Mattress. 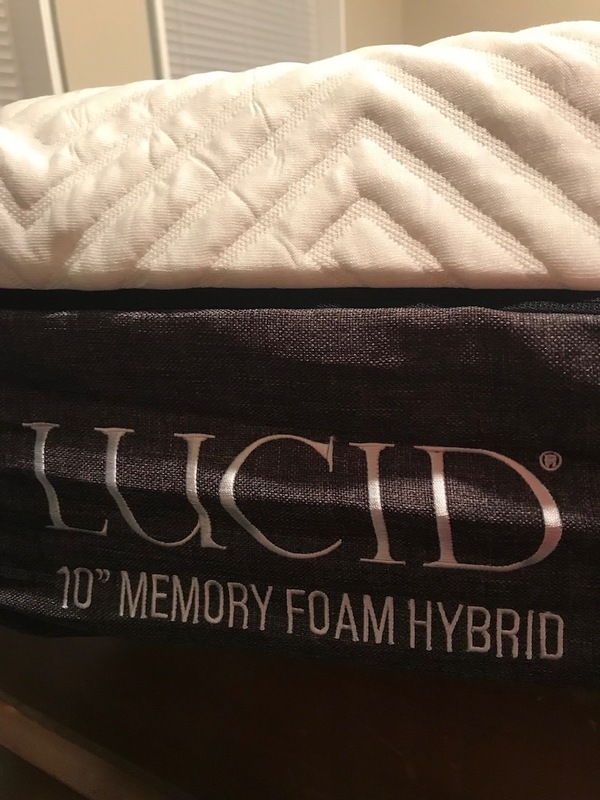 What Type of Warranty does Lucid offer on their 10 Inch Memory Foam Hybrid Mattress? The Lucid 10 Inch Memory Foam Hybrid Mattress comes with a 10-year warranty. How much does the Lucid 10 Inch Memory Foam Hybrid Mattress cost? Do we recommend the Lucid 10 Inch Memory Foam Hybrid Mattress? The Lucid 10 Inch Memory Foam Hybrid Mattress is a solid mattress. The price point makes it even more attractive to those on a budget. Priced at $329.99 for a queen and $429.99 for a king, you won’t find a cheaper mattress that is as nice as this Lucid. 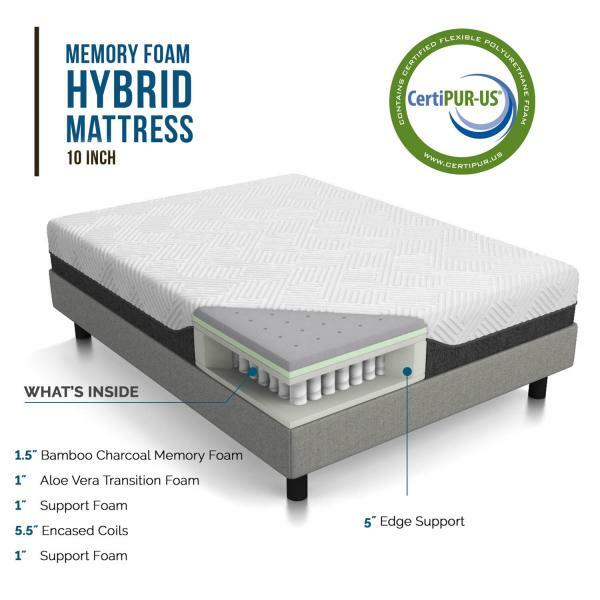 If you are looking for the comfort of memory foam with cooling of springs, the Lucid 10 Inch Memory Foam Hybrid Mattress will be comfortable, high quality, and affordable. Order the Lucid 10 Inch Memory Foam Hybrid Mattress here…..